I’m back from the backcountry. I saw a lot of interesting things near the Idaho/Nevada border, especially on the edge of the Owyhee, part of where the giant Murphy fire burned 13 months ago. 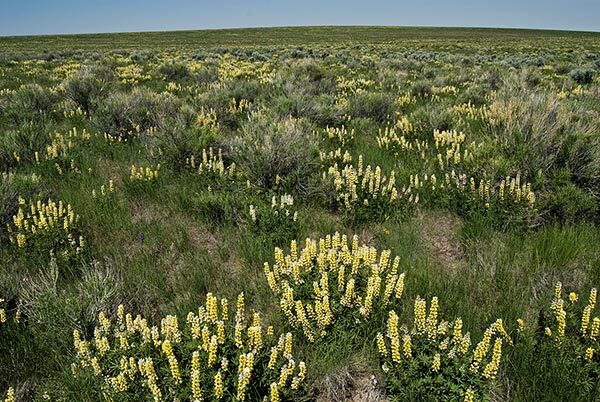 Lupine in bloom, NW of Devil Creek in the Owyhee country. June 16, 2008. Copyright © Ralph Maughan. This photo was not taken where the fire burned, although the fire does not eliminate the lupines, only the sagebrush and bitterbrush (that’s a bad joke). Lupine is poisonous, especially to sheep. It is a nitrogen fixer, closely related to peas. The wonderful smell permeates an area with blooming lupines. I did not know that lupine comes in yellow. We have tons of it in bloom here in Colorado. I think it’s all blue. I love the smell of it too. Oh yes. Lupines come in many colors. Most of them in this Idaho/Nevada border area are cream or yellow, but some are the more common purple. A number are multi-colored — bluish or reddish at the top of the flower spike, fading to cream. I noticed the yellow lupines smell different than the purple. The purple smell very much like peas. The yellow and cream, less so, with a pleasant “waxy” smell mixed in. lupine is an increaser under grazing pressure — probably for the reason ralph mentions — it’s poisonous. sure is beautiful — if you’ve ever noticed the seed pods it’s fascinating how they work. the pod grows in a spiraling fashion (if you were to see the filament like material). as the pod dries, the filament material strung though the casing constricts more than the casing itself around the developing seed – this builds up immense pressure. when seeds have matured and the pod is dry enough – the pressure releases launching the seed a distance from the mother plant.